For those of us who were alive that agonizing day, I don’t think we will ever let September 11 pass by without deep thought and prayer. Although the hideous act against humanity took place a staggering 16 years ago today (still can’t believe it), most of us can remember it like yesterday. Make no mistake about it, time has not been able to evaporate the feelings of loss, anger, and disbelief many of us still have. Rather, as time goes by, they seem to intensify. Just by living through that day, my heart will never let me forget how I felt when I woke up that morning and watched the towers fall. But if my memory ever starts to dull, I can thank historians and others for making sure we will never forget. Since September 11, 2001, I have consumed countless documentaries, movies, victim testimonials, photographs, and raw video of the attacks. This content, which I am borderline-obsessed with watching, always touches me in a certain way. 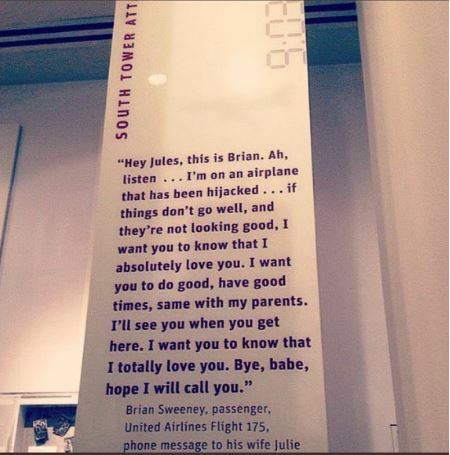 Today, on the 16th anniversary of the attacks, I was touched again. But this time, it was just a quote that gave me chills. When I saw this quote on my Twitter timeline this morning, I couldn’t help but feel extremely moved. Out of all the well-done, high budgeted, emotionally gut-wrenching 9/11 media I have seen, it was this photo that somehow popped up on my Twitter feed and really impacted me. This voicemail message from a husband to his wife instantly brought tears to my eyes. Over the past couple years I have become a softy. By getting married and having a daughter, I have learned so much more about love. To see a man, probably close to my age and standing in life, leave such a selfless and heartfelt message to his soul mate in a time of death and terror, hit me hard. How beautiful, how brave. This time around, it wasn’t watching helpless civilians jumping out of buildings or a contingent of heros busting into a cockpit that made me lose it. On September 11, 2017, it was something different. This time, it was pure love. Going to hug my wife extra hard tonight. Don’t Blink.